I spent a day speaking with a group of high schoolers about social media, Qlik, careers and data science. Thornton Melon: Please, try to understand. I don't have the background for this. I mean, the high school I went to, they asked a kid to prove the law of gravity, he threw the teacher out the window! In case you didn’t know, that quote comes from Rodney Dangerfield’s lead character in the epic 1986 movie Back To School (if you haven’t seen it, I cannot recommend it highly enough). 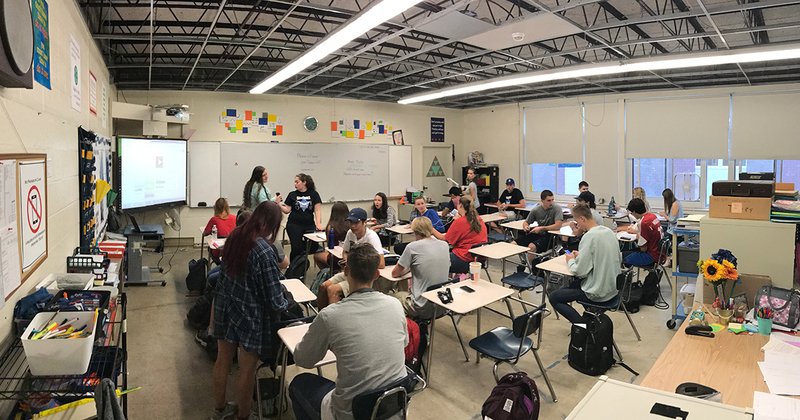 Now I will admit that my high school experience was not quite as rough as Thornton Melon’s but I was able to spend Monday morning speaking to a group of AP Stats students at Salem High School in Salem, NH. The class consists of 26 advanced placement juniors and seniors who are just about ready to graduate and looking to prepare for college math statistics courses. The class runs for about 1 hour and 30 minutes and we covered a wide variety of subjects: my education background, my career, my personal interest in data, and namely: how to use Qlik. That’s where the fun came in: the teacher Ms. Tecce invited the class to play a game they invented called Penny Golf the day before I joined them. Penny Golf is a fun game where teams of three attempt to toss 15 pennies as close to the hole as possible, measured in centimeters. The team who is closest to the mark across its three participants wins. So, I got my hands on the throw data and created my own Qlik Sense app to analyze how well the students did and here is what I came up with, calculating range averages across measurements of all 15 throws. The clear outlier on the right from Team I’s John O. (who I’m told is NOT the school quarterback). One of his final throws just continued to roll for over 1,400 centimeters! I also used Qlik to calculate totals for Min, Max, Mode and Standard Deviation of all their throws, the results of which you can also see below. It was an educational experience for the students to understand what Qlik is capable of, even operating with a simple Excel spreadsheet, but what was more fulfilling for me was being able to communicate the importance of understanding data science from an early age. There has never been a better time to be an AP Stats student, especially with the record growth of Data Science majors at universities worldwide. This is why I wanted to spend my annual CSR Change Our World Day educating the next generation of data scientists – to help them to understand the power that they wield…which they may not realize today, but it will pay dividends tomorrow!